Whip cheese till soft. Beat in sugar & peanut butter. Slowly add milk, fold topping into mixture, pour into pie shell. Sprinkle with nuts. Freeze till firm. Tomorrow night: A dessert featuring apples. Hmm, we just might have to put this one to the test. PB pie rocks! 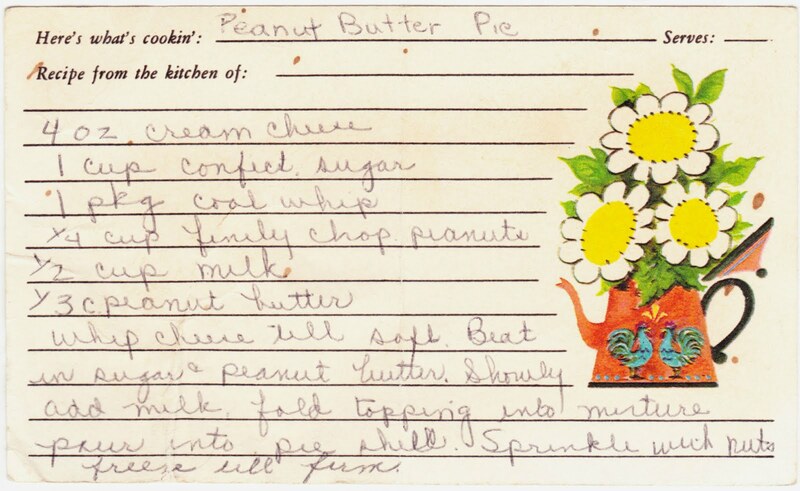 Holy Cow ... just look at the fabulously retro art on the recipe card! Yes, that art is fantastic. These cards are the gifts that keep giving.